How many tourists visit Machu Picchu annually? Machu Picchu is one of world’s most iconic archeological sites and Peru’s most popular tourist attraction. 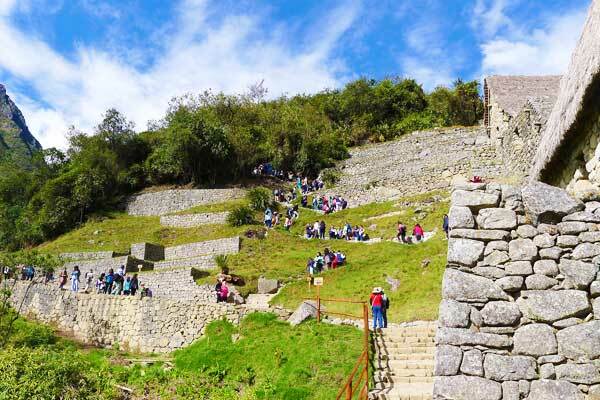 Since it’s discovery by Hiram Bingham in 1911, the site has been a key feature in popular culture and has garnered the interest of academics, history buffs, rugged travellers, backpackers and worldly explorers. In 1981 the Peruvian Government declared Machu Picchu a Historical Sanctuary, and this was quickly followed by UNESCO who declared the area a World Heritage Site in 1983. More recently (2007), Machu Picchu was voted as one of the New Seven Wonders of the World. The combination of its prominence among leading conservation programmes, relatively cheap travel and the information wave has led to an explosion of interest in Machu Picchu. The number of visitors to Machu Picchu each year has grown from the low 100,00s in the 1980s, to a peak of nearly 1.2 million tourists in 2013 – a 700% increase! 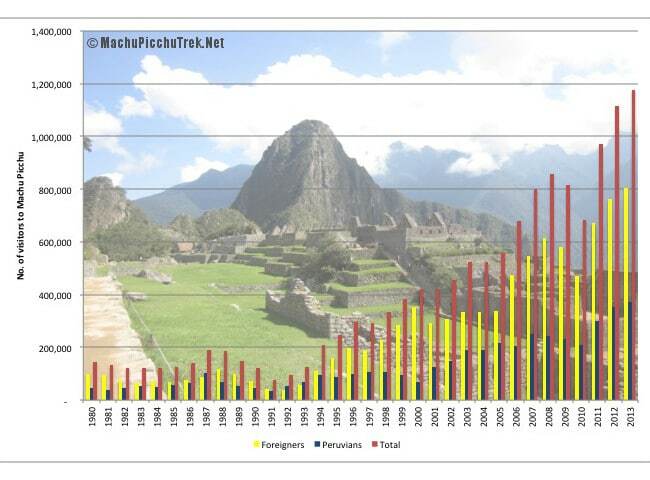 The chart below shows how many tourists visited Machu Picchu annually from 1980-2013. The yellow bar represents foreigners and the green bar, Peruvians. Concern over the impact of tourism on the preservation of Machu Picchu is significant. UNESCO have threatened to place the site on their endangered list and archeologists and academics have openly expressed their concerns. In response, the Peruvian Ministry of Culture reluctantly implemented new measures to curb tourism in 2011. The conflict between promoting tourism, which is a major contributor to the Peruvian economy, and conserving the famous site, continues to lead to mix priorities. Entrance to the site has been set at a limit of 2,500 tourists a day, and access onto the popular Inca Trail, a 4-day trek that leads hikers into Machu Picchu, is limited to 500 permits a day (300 of which go to porters and guides). There are also talks of new regulations coming into affect for 2015. In particular, the Peruvian government will likely pass new rules that will restrict the flow of tourists through three pre-determined routes in the ancient city. All tourists will also need to join guided tours that are limited to 20 people, and will only be allowed to stop for short periods along demarcated places on the routes. It is unlikely that Bingham ever imagined that the city he discovered in 1911 would become as popular as it is today, and he would likely turn in his grave if he knew how many tourists visit Machu Picchu annually. Gone are the days where one could arrive in Cusco and decide to trek the Inca trail or visit Machu Picchu on the spur of the moment. Today one needs to book their visit months in advance, and will undoubtedly share the experience with 100s of tourists. This means smart planning is key. Choosing to visit during the wet non-peak season (October-April), especially if you are not trekking, can be a good idea. The shoulder months of March / April and October / November provide the best balance between lower tourist activity and potentially good weather. Staying a night in Aguas Calientes before visiting Machu Picchu is also a good strategy as it means you can get up early to catch one of the first buses to ruins. The site is relatively quiet between 06:30 and 08:30, and gets particularly busy after 11:00. Hanging around until the late afternoon before the site closes at 17:00 will also usually guarantee you some respite from the tourists hordes. Alternatively why not consider a trek to one of many other Inca sites in the Cusco region. Choquequirao is a particularly impressive site that only gets 3,000-4,000 visitors a year, and can be combined with a visit to Machu Picchu! Do you know if Machu Picchu limits the number or visitors on a daily basis? Just wondering what kinds of crowds to expect. We’re going in October. Hi Peggy, Permits to Machu Picchu are limited to 2,500 a day. We recommend booking as early as possible, but you should be able to get permits a few weeks before you travel in October as this is not the busiest time of year. Where do you find the information about the limits with 2500 permits a day? Thank you for your help. Hi Magdalena, 2500 visitors a day is the official visitor limit set by the Peruvian government. Cheers!